Did you think that I was at the hospital? I am not sure why I think that is so funny or why I would think I would be tricking any of you! 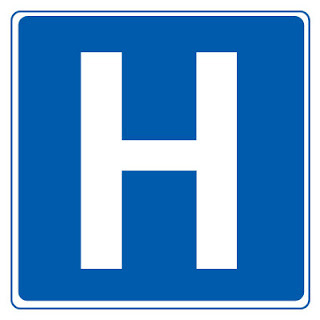 I have this sign up to tell you that they have our hospital on flu lockdown! No one 18 or under is allowed in the hospital (unless they are admitted). This ban is in effect until the end of February and the doctor we saw the other day even thought it would go into March. This is heartbreaking because this means that BellaRose can't come see us in the hospital and meet this little sister we have been talking about so much. Not to mention the fact that I am just going to miss her so much. I know I could leave the hospital early, but I don't believe I will be that drastic. I know people have issues about hospitals, but not this girl. I am happy to have someone take care of me for a few days while I recover. I think technically only relatives are allowed to visit, but the doctor said that they are not as strict about that rule. If 10 people were in our room they might say something but not if there is a slow trickle of visitors. We LOVED having visitors when BellaRose was born (no pressure though, really). It felt so celebratory. I guess these are the issues that arise with having a baby in the winter. We will keep everyone posted if that ban is lifted but it is not looking so good. What also is not looking so good is the weather, although I am thrilled to get a ton more snow! It is winter and if it is going to be cold and dreary why not have the white stuff too, maybe even another foot! I just hope we will be able to make it to the hospital if that need arises. We fully expect to have Hollings in a snowstorm, I just don't want Worth to have to deliver her! And here is something un-baby related to talk about, my new purse. This one is my favorite so far. You ask why I say "this one", well let me tell you this is my 3rd jcrew bag in as many months. What does a pregnant girl do with her birthday money, but buy an awesome purse to have for years and years until she notices that the stitching is coming out. I am not about to pay as much money as I paid for a purse and have the stitching come out, so I returned and got another, even better purse. I sort of like this, getting a new purse every month! Well I notice that the stitching was coming out on bag #2 and I am not having it so I return that one too! Jcrew (call center) was great about it and now I have this new awesome purse which is by far my favorite of the 3. I have noticed a bit of stitching doing weird things, but I am just hoping I don't have to return this one because I really like this one, and I am tired of the manager's glare at the store when I return the "damaged" purse. I just have vowed to become a better more savvy consumer. If a company really believes in their product then they will make it right for you. Jcrew has so far! 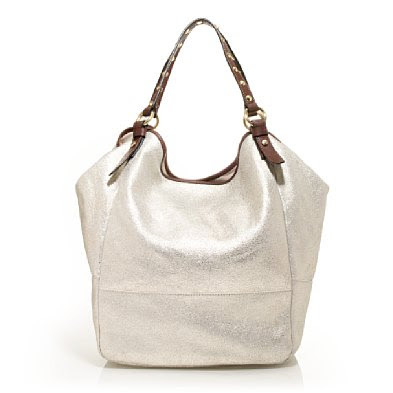 I just wonder what the Purse Pixie would say about this bag? Showers are a pretty amazing thing, don't you agree. I mean you have these friends, who the minute you get pregnant, start planning a baby shower for you and your little family. They plot, plan, and e-mail for months about what food will be there, what gifts to buy, how to decorate, and it is ALL in your honor and for the new life that is about to enter this world. Hollings will surely be one loved little girl, just as BellaRose is by all our family and friends. As I told you our Couple's Baby shower to honor Hollings was this past weekend at Matt and Margaret's house. It was also given by Annie and Dan, Becky and Jeremiah, Jennifer and Ben, Heidi and Richard, Nick and Niki, and Rachel and Seth, goodness, talk about the love! We truly felt so blessed! We also got some wonderfully beautiful things for Hollings, and even BellaRose got some gifts! BellaRose was our main photographer of the night. I share some of these pictures simply because she took them. The following three were taking by our sweet girl. She actually did a pretty good job! Look how cute this one bag we registered for was decorated (from my mom and sisters)! White onsies and socks, my favorite! I just adored seeing BellaRose in a plain white onsie. I am not sure why, but I loved it, and now Hollings will have the same experience, rather I will have the same experience! BR took this of the other bag that Jennifer (Worth's sister) got us. I did not realize how large these bags are, but I LOVE them. Jennifer had it filled with diapers, wipes, and other goodies! It was really amazing! This is just a funny picture of BellaRose, she wanted the camera back so badly! The final picture is of the flowers that are just GORGEOUS! I wish I took better pictures, and took pictures of the food that surrounded the flowers, but alas I did not. This is a the day after picture of the flowers on my messy table, but you can still get the idea of just how outstanding these flowers really are and the vase that Annie made. No I do not get to keep the vase, but do get to enjoy it for the life of the flowers! I could keep going on and on, and I know I will once the room is all together and I go show off everything! Thank you all so much, words will never do justice to how grateful we feel. So I know I have bragged about my friend JT(P) to you before, but I really have to do some bragging b/c this girl is A-MAZING!!! 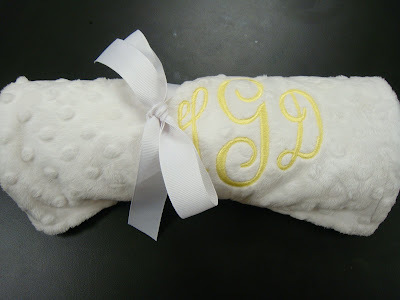 She has sewn and monogrammed so many things for me in the past. I am sure that you remember some of BellaRose's clothes that she has done for me in the past. They are all gorgeous, can be washed a million times and come out looking as good as new. 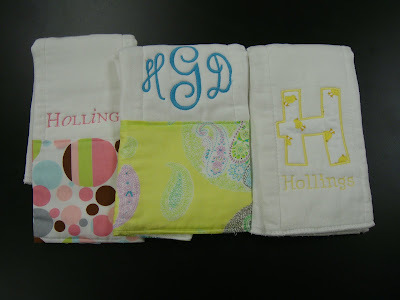 She even monogrammed some stockings for BellaRose's teachers. She is just too good. I have told her forever she needs to start selling her things and now she is! Here is her blog and you can make custom orders straight from her. 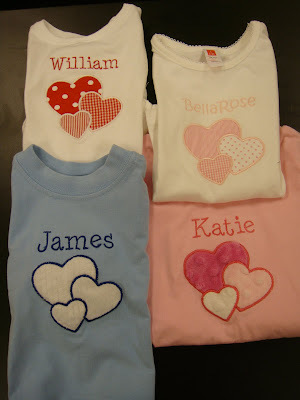 This is a Valentine's day shirt that she did for BellaRose, precious right! 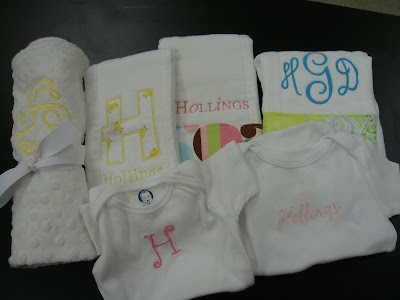 Here is the array of items she did for Hollings!!! I can hardly wait to see them in real life. Look at those initials. they are gorgeous!!! This is a changing pad cover to take in my purse so I don't have to lay that sweet bottom of Hollings' and on yucky changing tables at Target or as I recently saw written Tar-gucci (love it). Burp clothes! Can't have too many of these babies. We flew through these with BellaRose. Check out her blog and make an order!!! We celebrated Worth's 35th birthday this week! We first celebrated with his family at our house with some homemade lasagna and homemade semolina bread. I also made him a chocolate chip cookie cake, more for BellaRose then Worth since he does not like cake (but I think that he secretly does like the cookie cake). Then Worth celebrated with Frank going out to Frank's family farm to do some hunting and to just have fun. He will be celebrating again today with Matt who shares the same birthday week with Worth. Lots of celebrating! Next week we will be celebrating Hollings with a Shower thrown by several awesome people at Matt and Margaret's house. Worth and I are really looking forward to the shower and having some time to focus on the arrival of sweet Hollings. It is hard to believe that she will be with us so soon. This pregnancy has really flown by, I am just astounded. My sister, Kelly (and family of course), who just welcomed a bundle of joy herself got Hollings this sweet little blanket for Christmas. Isn't it pretty! It is neat to start to see her name and initials appearing around the house. Niki just brought a batch of newborn things over that used to be BellaRose's and have been passed through Ellen and Julia, and are now back to us. So neat to have so many girlfriends with so many girls, of course we love the boys too Heidi and Annie! As you can see, lots to celebrate. We are so thankful. It is easy for me to get so caught up in the lack of work that is out there right now for the construction business. It is just the times we are in, but I know we are so richly blessed and we will continue to be richly blessed. We have heat, we have a roof, we have lights, we have cars, we have our health, and most importantly we have each other! See so much to celebrate in these times when many people don't. We are almost complete with BellaRose's room. I LOVE her room, it is so cozy, but bright. The walls look more pink in these pictures. I think it must be the reflection from the lamp shade, they aren't quite that pink. We also won't have a blanket as her window shade and will put trim around her window, but it needs to be replaced first but when it is 7 degrees outside, it is not the best time to have a gigantic whole in your house. I know that sounds strange and all. Our heat literally has been running for 2 weeks straight. Can't wait to get that power bill! I can't complain though, I wanted a winter and we certainly are getting one!! Now it is time to focus on redoing the nursery and make it all things Hollings. Several years back my friends and I discovered an amazing skincare store in Biltmore Village called Turner & Co. Apothecary. We got to know the owner, Katina, through our many visits. We discovered we were having babies around the same time and BellaRose was actually born on Katina's birthday! Small world. She closed the store to be with her daughter, Eleanor, and sadly my skin has never been the same. I had the chance to take some pictures of the gorgeous Eleanor not too long ago and see Katina and Brian. Katina has since opened another company under the same name Turner & Co. In Katina's own words "Turner & Co. elevates occasions, & enhances the everyday. We provide the tools & expertise to create the most thoughtful, memorable & elegant affairs- from everyday entertaining to elaborate weddings. At Turner & Co. we believe quality should be in everything & everywhere you look. Style extends from your morning coffee, to the cup in which you serve it; from your handbag to your bedding; from gifts to destinations-Turner & Co. inspires women to live well everyday & advises on the finest & most authentic appointments for fine living." 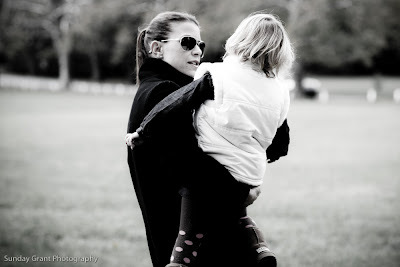 Today I am so happy to announce Sunday Grant Photography is featured on Turner & Co. blog! Such exciting news for me! Thank you Katina!!! 2010 promises to be a big year for us, if for no other reason, than the welcoming of Hollings into our family, which of course is plenty of excitement for one year. We have BellaRose completely moved into her big girl, and now we just need to reset up the nursery and complete the big girl room and we will be ready. Do you guys realize I have 8 weeks left, well I will say 9 weeks since BellaRose was late and I am just going to put that in my head. I think it will make life easier for me that way. It is hard to believe we are in a new decade and that Worth has been my "other" for 10 years. Yes we have had ups in downs in those many years, but we have come a long way and have established a good life here in the mountains. I don't like to make resolutions. They lead to let down and disappointment but I do like to make goals. I have my photographic goals: to double what I made last year, to really learn lighting, to buy a iMac desktop computer with the income earned from photography, to be viewed as an artist. Personal goals: to raise BellaRose and Hollings up as good sweet people (this is really a lifetime goal), to lose the baby weight (yes I am thinking about that already), to not be completely rocked by having a newborn like I was with BellaRose. I know it will be hard and very tiresome, but I know going out of the house will be easier, it has to be right, I mean I have done it before I can do it again!